Officers and crewmembers of the SS Wright, a Crowley-managed, U.S. Maritime Administration (MARAD) Ready Reserve Force (RRF) ship, were recently honored with Merchant Marine Medals for Outstanding Achievement for their duties in the wake of Hurricane Maria. 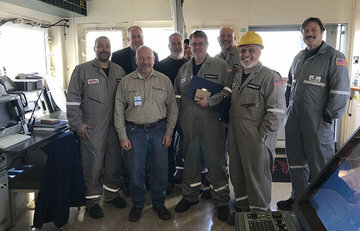 The medals were awarded by Jeff McMahon, MARAD ship operations and maintenance officer (SOMO) for Atlantic Operations, while the vessel was recently in port in Morehead City, N.C. The medals and the MARAD Administrator’s Professional Ship Award recognize the crew’s participation in humanitarian operations in the U.S. Virgin Islands (USVI) where they provided onboard accommodations to nearly 4,000 different emergency responders and almost 10,000 meals. In addition to providing berthing assets, the SS Wright carried an FAA mobile air traffic control tower critical to reopening air transportation to and from the islands, along with a significant number of containers loaded with meals ready to eat (MREs), bottled water and tactical/response vehicles from Philadelphia, Penn., to St. Thomas, USVI. When not being used during emergencies such as this, the S.S. Wright (T-AVB-3) is a specialty reserve, aviation logistics support container ship. It is part of the National Defense Reserve Fleet, which is activated for national defense and emergencies.